Nigeria's anti-corruption agency has arrested one of the country's leading politicians on suspicion of defrauding the country, an official said. 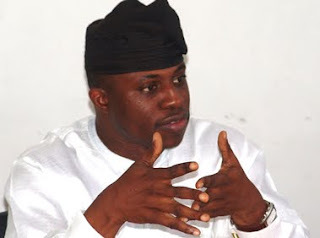 Officers arrested outgoing speaker of the house of representatives, Dimeji Bankole, at his home in Abuja on Sunday, after he resisted arrest for more than four hours, said Femi Babafemi, a spokesman for the economic and financial crimes commission. Babafemi gave no additional details about the allegations facing Bankole, other than to say that he would be held "in custody to enable him to have sufficient time to answer questions on the numerous fraud allegations against him". Bankole apparently refused several requests by officials to be interviewed. "An intelligence report ... showed that the former speaker was planning to leave Abuja for Lagos on Sunday evening and thereafter flee the country through an illegal route," a statement from Babafemi read. It was not immediately clear if Bankole had a lawyer. His spokesman, Idowu Bakare, previously issued a statement saying Bankole "never benefited" from his position, including taking a more than $66m (£40m) loan from United Bank for Africa PLC for his office. That was on top of his annual salary and money already budgeted for his office, which runs into the millions of dollars. Positions in Nigeria's national assembly are highly lucrative, where even low-ranking members earn more than $1m in salaries and benefits, plus the ability to direct a swollen budget in a nation where billions in oil revenues routinely go missing. Bankole conceded defeat to an opposition party candidate in Nigeria's April elections, one of a number of prominent politicians who lost their seats in the national assembly. Many pointed to Bankole's defeat as a sign that Nigeria's elections, typically marred by fraud and thuggery, had improved over the country's 12 years as a democracy. However, ballot-box stuffing and violence dominated later polls, with more than 800 people dying in religious rioting after the presidential election. Nigeria, one of the top crude oil suppliers to the US, has a long history of corruption, with one officials once estimating the country has lost more than $380bn to corruption since gaining its independence from Britain in 1960. Corruption trickles down from corrupt politicians in Abuja to the lowest police officer shaking down bribes from motorists at one of the country's many traffic checkpoints. Bankole's detention is the highest profile case in many months for the economic and financial crimes commission, founded by former President Olusegun Obasanjo in 2003. While critics say Obasanjo used the agency to go after his opponents, officers did make major arrests under then-chief Nuhu Ribadu. After late President Umaru Yar'Adua's administration forced Ribadu out of office in 2008, the agency largely fell quiet. A US diplomatic cable released by WikiLeaks shows diplomats have questioned new agency leader Farida Waziri's preparedness and willingness to take on the country's powerful political elite. Waziri has been slow to prosecute many of the high-ranking politicians once under heavy scrutiny – even after Yar'Adua's death last year.